I just learned not all requested amounts are allowed as grants from Fidelity Charitable, the largest provider of donor-advised funds. Someone had to wait more than two weeks to get a $600 grant because of $0.14. Yes, 14 cents. Longtime readers know my wife Lin’s favorite charity is DonorsChoose. The balance left to meet her goal for one dedicated Chromebook was $611.86. 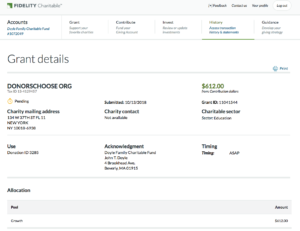 So we went to their DAF Direct widget, found it already populated with the $611.86 amount, and pulled down to the option for Fidelity Charitable. We got an error message, but no explanation. 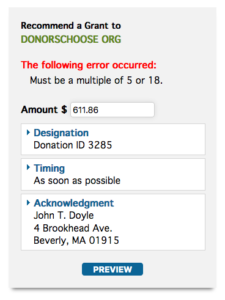 We contacted DonorsChoose and said we’d make the gift when they got their widget working correctly. They responded back that we should just write a check. This went back and forth for two weeks without any successful progress. Must be a multiple of 5 or 18. I wasn’t sure what that meant and couldn’t find anything about it. I divided $611.86 by 18 and didn’t get a whole number, but when I rounded up the grant request to $612.00, it went through. Two weeks of back and forth emails between Lin and DonorsChoose because of $0.14. Lesson learned today and for all to consider: Make sure ALL the ask amounts you suggest to your donor-advised fund donors are divisible by 5 or 18 so THEY will have no trouble making gifts to you from Fidelity Charitable or anywhere. Make sure anything you are doing with an odd amount passes this test! FYI, these are all divisible by 5: $50, $100, $200, $500, $1,000, etc.